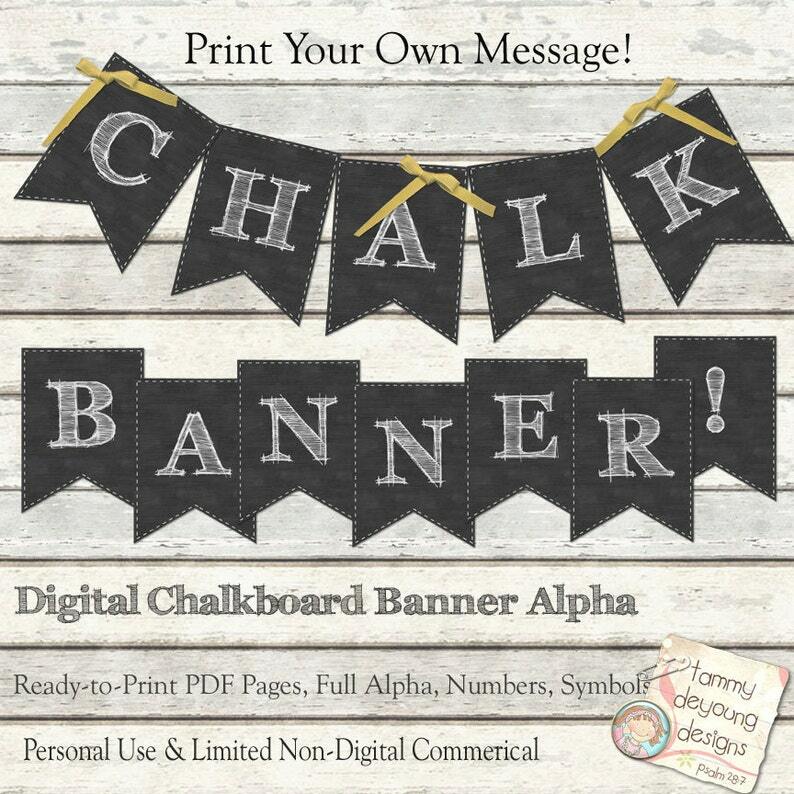 Printable Chalkboard Sign Banner full Alphabet for Wedding Banners, Graduation, Anniversary, Birthday bunting pennants you print for any themed party! Choose any phrase you want! Simply print the letters to spell your phrase on card stock, cut and string! To resize, simply change the printer settings to enlarge or reduce the entire page. Colors may vary slightly due to monitor and printer variations. Files will be available for download in your Etsy Purchase Account once payment is complete. "Oh the Places You Will Go"
*No actual product will be shipped. Watermark or logo does not appear on actual images purchased. NO DIGITAL DISTRIBUTION ALLOWED, even freebies. File downloaded without any problems. The only thing I will say is that the black is not a true black. It's more of a black that has been covered in a light dusting of chalk. But I'm still happy with my purchase. Thanks. Loved It ! Easy banners to make with what you want to say. I accept Etsy gift cards! ALL SALES ARE FINAL ONCE FILES ARE DOWNLOADED!! If you have NOT downloaded your files and need to cancel, please send me an Etsy convo with your request. If there is an error on my part, I will do everything I can to fix or replace the product. Please send me a convo if you have any problems, concerns or questions so I can help you find a solution! Please read the following and be sure you agree before purchasing my products. EU Customers in VAT tax areas---VAT taxes on Instant Digital Downloads are calculated and collected automatically by Etsy in compliance with the law. Please contact Etsy directly with any problems regarding VAT. Thank you! By purchasing and installing Tammy DeYoung’s digital files, you are agreeing that they are the property of Tammy DeYoung and licensed to you as a single user. You MAY NOT display any of my products for download on any site on the internet, nor on any file share service, including Picasa, Photobucket, RapidShare, etc. You MAY show my product previews in your blog galleries or on Pinterest if you are just sharing information on what you purchased, but NOT the actual downloadable images for others to download When displaying my product previews (on places like Pinterest) please include a link back to my product/store. LIMITED PRINTED COMMERCIAL USE for small business/handmade-by-you PRINTED crafts as explained in the FAQ's below. If you aren't sure whether your products qualify, please send me a convo! When in doubt, remember, NO DOWNLOADABLE PRODUCTS ALLOWED, no tubes, no freebies, no digital stamps, embroideries, cutting files, etc. without written permission. LIMITED PRINTED COMMERCIAL USE means non-digital, printed products in quantities up to 200 items, only made by your hand, distributed directly by you, and not mass produced or sold/produced by on-demand sites such as Zazzle, Cafe Press or Spoonflower. See the FAQ's below for more details. COMMERCIAL PRODUCT CREATION: Your printed, commercial products should be a DERIVATIVE of my work where my original artwork makes up no more than 50% of your finished product UNLESS YOU HAVE WRITTEN PERMISSION OTHERWISE. It should not be my images just printed and resold as is. It should be a combination of my images and YOUR creative process. For example, my clip art images resized and placed on a white background and then printed on sticker paper is not your creation. But combining my clip art images with other elements like papers and borders then making them into labels, tags etc. IS your creative process. on the printed product as well as on any packaging or website display so that it is clear to the buyer that you did not create the artwork. For example, a sheet of stickers made with 50% or more of my images should have "Artwork©Tammy DeYoung" printed somewhere on the page of stickers AND on the page where it is being sold, such as in your Etsy description. *Modify the files for your own PERSONAL USE. *Print as many items as you wish for PERSONAL USE. *You may sell printed products at craft shows, booths in craft mall stores, boutiques, or websites, BUT NOT print-on-demand sites such as Zazzle, Cafe Press or Spoonflower. individually or in a collection, such as digital kits. *Use the product for freebies or file share in any form. *Use the Product for brushes, stamps, or other digital products in software programs such as Photoshop, for resale. *Use my photographs or product shots for marketing your items made with my product--you must use your own photo of the actual product handmade by you. *Use my products to make web designs or blog designs, templates, logos, or websets without written permission. PLEASE DO NOT FILE SHARE! IT is ILLEGAL! For any other uses not covered above or in the FAQ's below, please convo me to obtain written permission. Thank you! This TOU was updated March 9, 2017 to include a better clarification on collage sheets and derivative works..
May I cancel or return digital items? If you have not downloaded your files, contact me through the Etsy convo system with your request. Once files are downloaded, they may not be returned or cancelled. If there is a problem with your file, I will work with you to fix the problem and/or replace the file. Do you allow commercial use of your products? ONLY if YOU (no outside sources) are making a handmade item PRINTED & sold/distributed as a FINISHED product in quantities less than 200 copies. Example: printed cards, printed tags, printed invitations, printed scrapbook pages, etc. SEE LIMITS IN MY POLICIES ABOVE! Your products MAY NOT be produced by outside sources or print-on-demand sites such as Zazzle. Any quantities of FINISHED, printed products over 200 require written permission and possibly an additional fee. Remember, I own the copyright to all of my artwork/products. Your purchase only gives you permission to use my products under these terms. The copyright always remains with me. DIGITAL COMMERCIAL USE: NOT without written permission from me. Do you allow redistribution of your artwork in DIGITAL formats such as digital downloads? May I use your artwork/products in my websets, website, branding, or logos? No, my artwork is not intended for use in your branding or website identity because it is my own brand and this can confuse customers. I encourage you to seek the services of someone who designs custom logos and branding items just for you! However, some uses of certain products MAY BE allowed on a case by case basis so please contact me with your request before making a purchase. Do you design all of your products? Are they your original designs? Yes, I am the designer behind all of my products. All of my clip art and line art are my original drawings as are many of my papers. HOWEVER, I do use some commercially purchased designer tools for many of my papers & scrapbook kits. I also use some commercially purchased clip art for many of my printable products. I always try to give credit to the original clip art artist in my products details at the bottom of the page. Is there a limit on how many items I may print? There is NO LIMIT to how many items you print yourself for your own PERSONAL use. That's what makes printables such a great value! But you MAY NOT print more than 200 of the same item for any COMMERCIAL USE without written permission. Printing must be done by a home printer or a local printer such as an office supply store but NOT to a commercial manufacturing company such as Zazzle. Are there any other products I'm prohibited from reproducing your artwork on for resale? If you are interested in manufacturing any of these items with my artwork I am always happy to discuss a licensing agreement. Just send me a message through convo! Is it ok for me to share your product downloads with my friends & family or post them on the internet? No, this is called file sharing and it is illegal! You may NEVER post the download links anywhere. However, you may share the PRINTED items that you create with my products with your family and friends, or show-n-tell the product online but NOT the download link itself. Please refer them to my shop where they can purchase their own copy. If I loose my files, do you store or resend them? Yes, but only within 30 days of purchase. (This has been in my Shipping policies for many years). It is EXTREMELY IMPORTANT that you back up your files to an external source such as a disc, stick, or backup hard drive. Computers crash all the time and I cannot resend the files after 30 days. Please take responsibility at the point of purchase to back up your files.